A pretty, cheerful welcome to enhance your home where it will make a difference every day. Commission your own hummingbird welcome sign! 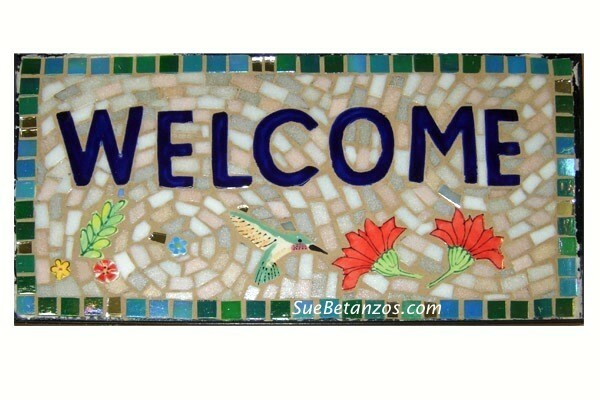 Large Mosaic welcome signs like this hummingbird make a statement for your home decor, indoor or outside. Each is handmade and slightly different, unique. The hand welded sturdy metal frame makes this artwork durable as well as lovely. Smaller, less complex mosaic signs can also be commissioned. Each is in a custom handmade iron frame, ready to hang. Wonderful as housewarming and holiday gifts.